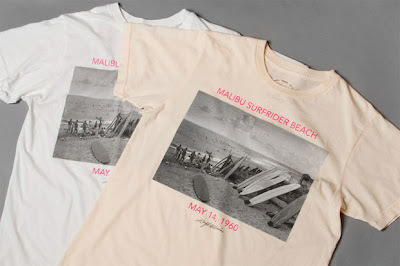 Collection includes 3 shirts - each featuring photos shot by Leigh Wiener in May of 1960. Leigh Wiener was an award-winning American photographer and photojournalist. In a career that spanned five decades, he covered hundreds of people and events. His images captured the public and private moments of entertainers, musicians, artists, authors, poets, scientists, sports figures, politicians, industrialists, and heads of state, including every U.S. president from Harry Truman to Ronald Reagan. On a faithful summer day in 1960, on assignment at Malibu, he turned his lens on the hoards of surfers at Surfrider Beach capturing a pristine moment in the history of Los Angeles surf culture. The shirts are available at select retailers worldwide. In Southern California you can find them at American Rag, Ron Herman, Thalia Surf Shop, Reserve, and Fred Segal Man.